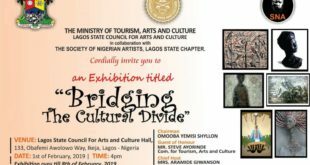 The Lagos State Council for Arts and Culture, in conjunction with the Society of Nigerian Artists, Lagos State Chapter, is set to hold an eight-day Art Exhibition tagged: “Bridging the Cultural Divide” at the Lagos State Council for Arts and Culture, Awolowo Way, Ikeja from 1st to 8th of February, 2019. According to a statement by the Lagos State Ministry of Tourism, Arts and Culture, the event will celebrate and showcase the paint works of contemporary and notable Artists like Bruce Onabrakpeya, Kolade Oshinowo and Abayomi Barber amongst others. The statement noted that the aim of the exhibition is to provide a platform of expression for creative upcoming artists and expose their works on local culture to art enthusiasts and entrepreneurs expected at the event. It noted that the exhibition is another demonstration of the present administration’s attempt to provide anenabling environment for established and fresh creative minds to attract patronage and investors. “It is also expected to encourage the growth of micro and small scale enterprises across the tourism, arts and culture value chain”, the statement added.